The configuration file is excluding the unnecessary folders and files during a .wim backup session. Thanks for this new feature. I am attaching the x64 version of the volume shadow copy tool. Could you add also the check and verify options of imagex.exe to support the wim backup option of CloneDisk? Error 87 means "The parameter is incorrect.". Was there an wimgapi.dll on your winpe 1.x? either in the system32 or next to the clonedisk.exe? Winpe 1.x is based on XP/2003 right? Any particular constraint to stick to this "old" version? WinXP thus should not be a problem (I tested it with wimgapi.dll 6.0.6001.18000). Also, if the wimgapi.dll was missing, CloneDisk should explicitly gives an error about it. WinPE 1.x based on XP is light weighted and it can be modified easily. wimgapi.dll and CloneDisk are on the same folder. It would be GREAT if there could be an option to update a disk image with any new changes that occurred (thereby performing a Differential Backup). Also permit the browse of the image for files restore. Edited by steom, 10 February 2014 - 07:36 PM. Is not this possible with differencing VHD's or appended WIM's ? I could for sure add support for this two features in CloneDisk. For now CloneDisk can save to WIM (but not append) or create/attach VHD (fixed or dynamic). glad to hear your words! this would allow original full image to can be safely removed/put into a safe place and and keep it compressed. Edited by steom, 10 February 2014 - 08:47 PM. Following last thread from Steom around differential backup : CloneDisk 2.0.8 can now append to a wim file. 1-Backup your drive to a WIM file. 2-Make some changes to your drive. 3-Backup your drive again to the same WIM file. CloneDisk will propose to delete or append the existing WIM file (choose append). ->Only the changes since last backup will be saved to the WIM image. When restoring, use the last image index (#2 in the above scenario) to restore all datas+changes. it will be possible to not append but to store the differential backup to another file? 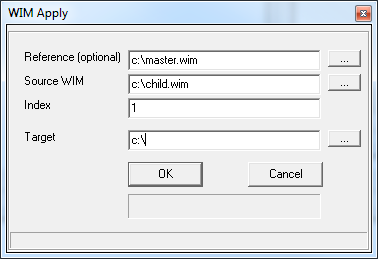 and the WIM method requires you to handle the partitition attributes like : MBR, BS, Active... like a simple file copy? ->Use another wim file to store differential backup : I believe yes, these are called reference files (coming in next version). This version can deal with differencing VHD's. -Create a first VHD (or turn a raw image into a VHD) : this our parent. -Create and attach a second VHD specifying a parent (the one created in step 1) : this our child. ->We now have a differencing VHD. You can later either delete the child VHD or merge it into the parent. Beware, when you have a child VHD, you should not alter the parent VHD or you will lose the relationship between the parent and its child. Based on Steom's post "it will be possible to not append but to store the differential backup to another file? ", CloneDisk can now use alternative wim files (one could also call these differential WIM's ?). 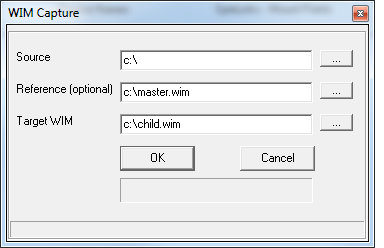 1-Create a WIM file : this is our "master"
3-Create a second file specifying a reference (master) WIM file : this is our "child"
->You now have a "differencing" WIM file. Note that this is different than appending datas to a WIM file. Also, I could not find this option (alternate/reference file) using gimagex or dism ? See attached screenshot for WIM Capture/Apply. Great work Erwan, you are really fast! in clone/backup to image, there is only raw and wim, i think would be useful to have also vhd option. its possible to implement raw image compression? like xz instead of obsolete gzip/bzip2. what is the clonedisk wim compress format, LZX or XPRESS? in the readme i see that from version 1.5 you added command line option, is there still? do you know/have never tried ODIN? Edited by steom, 16 February 2014 - 06:14 PM. In the past I had implemented RAW+GZ but it was not very useful : super slow/cpu intensive. 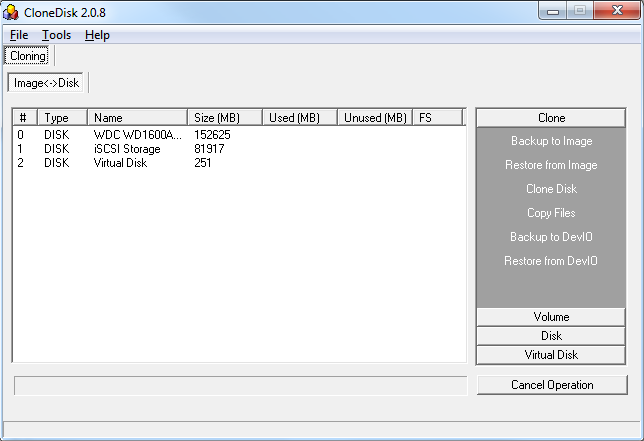 Note that I have also dropped "used NTFS clusters" backup for now (I will re use the principle with dynamic VHD). When one wants to prioritize space, WIM is a better option. Soon, I will indeed implement direct VHD backup (next to RAW & WIM) although you can already turn a RAW image to a (fixed) VHD with clonedisk. A future version will implement dynamic VHD backup thus allowing space optimisation. 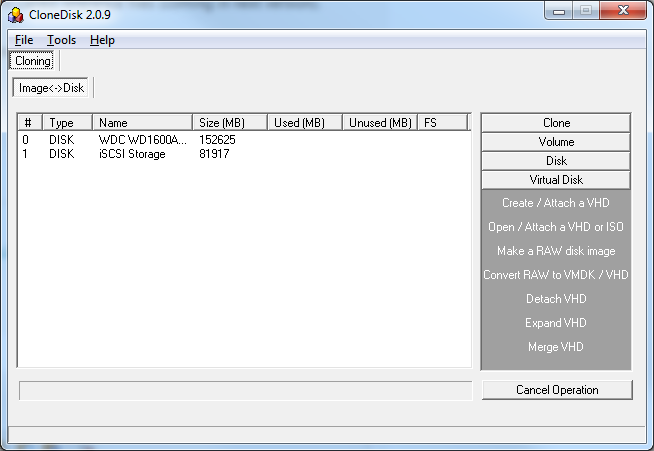 What you can do already with CloneDisk is create a dynamic VHD and clone your disk to this dynamic VHD. About WIM, I use XPRESS for now but I could propose it as an option in the future. About command line, yes, it is still there. About ODIN, yes I know this one : very good software. About xz compression, can you tell me more? how can i call the command line help? like gzip or bzip2 can compress to nul or to stdout but faster and with better compress ratio. yes ODIN is a very good software it only lacks diffential backup and browsable image support. Call and the exe from the command line and it will display the help on the console. About xz, if there is a pascal unit out there, I could give it a try. But about compression, I might look on devio / proxy side (from ImDisk package). I am not sure ODIN developpement is other and I am not sure either CloneDisk can be seen at its legacy : it covers different areas (even if areas are crossing). Hello Erwan and thanks for the development! There is a typo in your first link : http://www.datarescu...cue/v3/drdd.htm . About cloning from end to start, I shall be able to propose that feature without too much efforts. About bad hard drives, CloneDisk can deal with bad sectors : it will skip bad blocks and replace it by 0-filled 64k blocks. About re maping: it deviates a bit from CloneDisk original purpose : at best could I reproduce what a chkdsk /r command does today. erwan your software is good....but where is compression ? How can we compress image while creating it and decompressing while restoring ! Today you can use WIM files within CloneDisk for logical drives : it will use LZX compression transparently. If you are ok with backuping your logical drives (i.e datas only), then this is best deal. For physical drives (as opposed to logical drives), for me the priority was to keep a format that can be mounted afterwards. Hence there is no compression today. In a mid term future, I am planning on offering dynamic VHD which will help one to save disk space. Some alternatives I am considering (but time is lacking for now) : use 7z compression, use compression thru a imdisk proxy. I like the imdisk proxy idea as we could still then mount the compressed image. I would like to add that the reverse mode could be useful not only on cloning but also on image creation. This really helps extract data from some bad drives. Would be possible to have on Offline Registry session an option to detect SATA controller and install (inject it) on the offline system? Maybe searching from http://devid.drpsu.com/?l=en. Would be a great feature, since a OS migration to different hardware usually gives us errors regarding missing disk controller. DriverInjection GUI + MSSTmake (that makes two of them).